We wound up ordering the 5 Stars on Vermicelli and the 5 Colours on rice combos. The upside of an empty restaurant was that the service was quick with the food hitting our table shortly after ordering. However, the downside of an empty restaurant was that our server didn't really care much about providing great service. 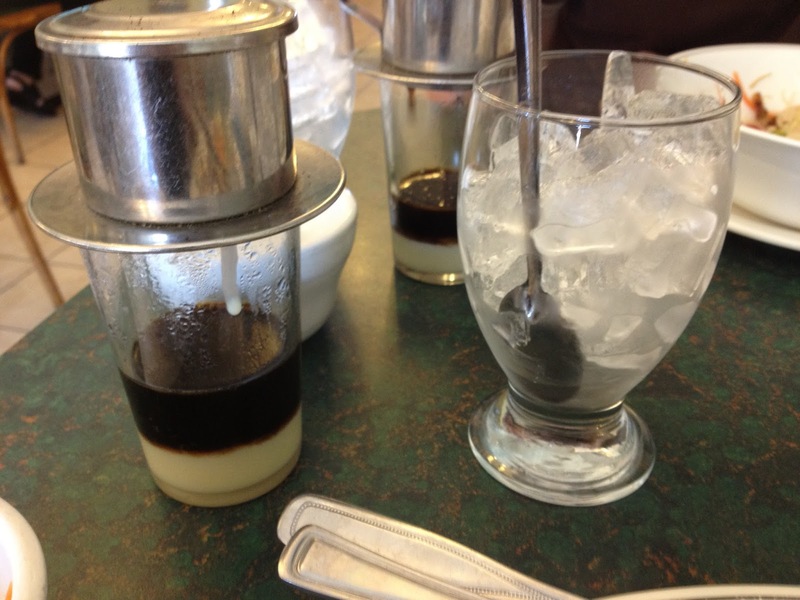 Although the food had arrived quickly, our Vietnamese iced coffees were a different matter. Our server was sitting two tables away from us reading a newspaper, when we called over to inquire about the status of our iced coffees. He replied that they were coming without even looking up. Granted we felt like we had to cut the guy some slack since he was wearing an oxygen tank, but you would think he could at least look up from his paper to reply? 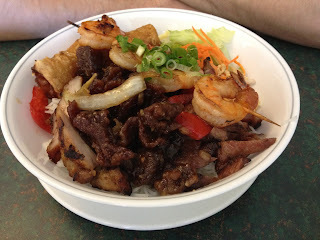 The 5 Stars on Vermicelli consisted of ginger feeb, grilled shrimp, grilled chicken, grilled pork and a spring roll. The humans said the ginger feeb was very crisp with a prominent ginger taste. The shrimp had a nice definite smokey, off the grill flavour to it, while the crunchy fried exterior of the spring roll was perfect, however the accompanying fish sauce had a very mild taste, not as fishy or sweet as we were used to or liked. 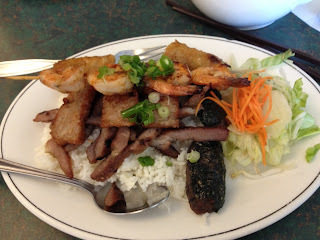 The grilled pork was the least appealing item in the bowl, resembling spam in both look and taste. The 5 Colours on Rice had grilled shrimp, BBQ pork, tropical feeb, grilled meat loaf and a spring roll. The BBQ pork was tender and juicy, with just the right amount of fat on it to give it flavour and wished there was more of it. The humans thought the tropical feeb was tasty, but again not nearly a large enough portion to satisfy. The grilled meatloaf was the least favourite part as it had an off-putting taste to it that we sadly could not identify, but were not keen on finishing. When we finally received our Vietnamese iced coffees, they were very strong, even mixed with the condensed milk, and not as enjoyable as those we had had elsewhere. Overall we enjoyed the combos that we ordered, with only an item in each that we could have done without. If craving Vietnamese food, although it wouldn’t be our first choice, it would certainly do as a secondary option. Your rating on their Vermicelli is unbelievable. I think I should really try it if I have a chance to visit there. I like food reviews. When I see them on the television, I can't help but wonder how awesome their career is. The video clips look great and they totally enjoy what they do.